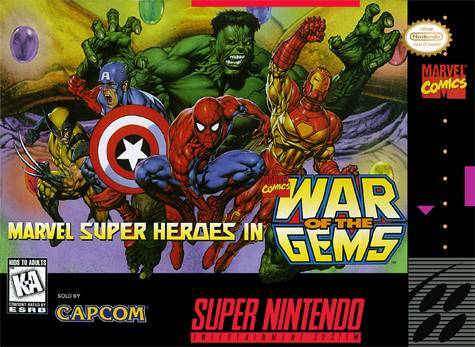 Marvel Super Heroes in War of the Gems for Super Nintendo allows you to play as Spider-Man, Captain America, The Incredible Hulk, Iron Man, and Wolverine in an effort to stop a mysterious foe from combining the powers of the Infinity gems. Choose the character best suited for each of the 10 levels. As you progress through each level, you will have to fight a variety of super villains including: Magus, Dr. Doom, Blackheart, and Thanos.